The Glendale Freeway (SR-2) was originally planned and constructed in 1959 to connect with the Hollywood Freeway (US-101) through the neighborhoods of Silver Lake and Echo Park. In 1962, as a result of local community opposition, the full build-out plan was rescinded and construction was terminated at the present SR-2 terminus near Glendale Bl and Duane St. Since then, commuter traffic coming of and on to SR-2 has passed through the community, primarily along Glendale Bl and Alvarado St and has contributed to congestion. A Federal Transportation Equity Act for the 21st Century (TEA-21) and a High Priority Highway Project Authorization grant were provided to upgrade the southern terminus of SR-2 and help manage the flow of traffic and address safety concerns. The purpose of this project is to develop a balanced transportation system that better serves local and regional transportation needs through improved management of traffic flow; enhanced pedestrian and non-motorized accessibility and safety at the SR-2 terminus; and creation of a context sensitive designed community open space in the immediate vicinity. On December 10, 2009, the Metro Board of Directors authorized completing the required environmental analysis and preliminary engineering of a Hybrid Alternative for inclusion in the Final Environmental Document. The proposed Hybrid Alternative addresses issues and concerns raised during the public comment period and includes several new elements such as retaining the existing flyover connector for southbound Glendale Bl traffic, installing a ramp meter on the existing flyover connector operating during peak hours, enhancing end-of-freeway traffic control devices to slow down off-peak traffic flow, etc. The Final Environmental Document was approved in December 2010 with a Mitigated Negative Declaration (MND) and Finding of No Significant Impact (FONSI). The Hybrid Alternative is recommended to Caltrans as the Locally Preferred Alternative (LPA), inclusive of the proposed improvements that enhance vehicular and pedestrian safety and provides an opportunity to create an open space in the SR-2 terminus project area. The next phase of the project includes preparing the Phase I Plans, Specifications and Engineering (PS&E). Caltrans is utilizing the TEA -21 earmark funds for the PS&E which started in February 2012. Phase 1 will be split into two phases, Phase 1A and Phase 1B. Phase 1A construction was completed in November 2013. Safety related improvements included: speed feedback sign, lane restriping and replacement of freeway signage. Phase 1B improvements include installation of ramp meter on the approach to the flyover, extend existing median on Glendale Bl, replace lighting under the Glendale Bl bridge, repair sidewalks, retrofit ADA ramps, add crosswalks at several intersections and construct soundwalls. The open space area between the flyover ramp and the back of the Glendale Bl sidewalk will be re-landscaped to improve its appearance. Final design for Phase 1B is concurrent with Phase 1A; however, due to its more complex scope of work, construction is anticipated to begin in Winter 2014/2015. Phase 2 includes the realignment of the southbound off-ramp east of the bridge (adjacent to the northbound on-ramp), demolition of the existing diamond configured off-ramp and sidewalk, and construction at the ramps on Glendale Bl. This phase of the project is currently not funded; therefore, final design will begin after funding is programmed for this work. Caltrans began the PS&E in February 2012. Phase IA will deliver some safety related improvements earlier. Phase 1A construction was completed in November 2013. Phase 1B is expected to be completed Winter 2015/2016 and construction is expected to begin in winter Winter 2014/2015. * Preliminary Schedule, subject to change. 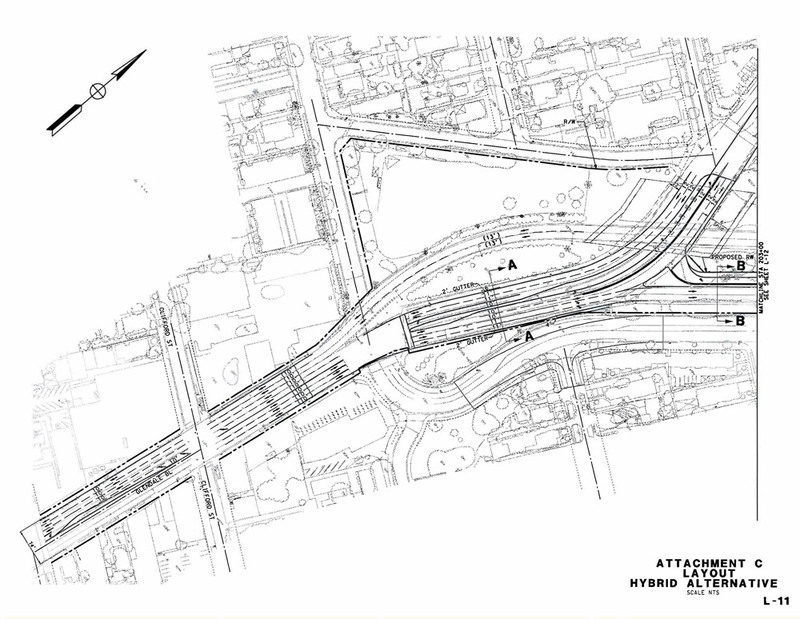 During the alternatives analysis and environmental studies Metro and Caltrans studied six alternatives ranging from the full removal of the bridge and flyover to a No-Build Alternative. Metro conducted extensive community outreach and valuable input was received from the local community and elected officials throughout the study process. In December 2009, the Metro Board of Directors considered all the competing technical, environmental and community inputs and approved a Hybrid Alternative to move forward for preliminary engineering and final design. This Hybrid Alternative combines the best features from the range of alternatives considered and addresses the projects Purpose and Need Statement: To better manage the traffic and improve safety in the area. The Hybrid Alternative retains the existing flyover connector for southbound Glendale Bl traffic. Beginning March 2014, Caltrans district 7 will lead the Final Design and Construction of the SR-2 Project's Hybrid Alternative, Phase 1A and Phase 1B.